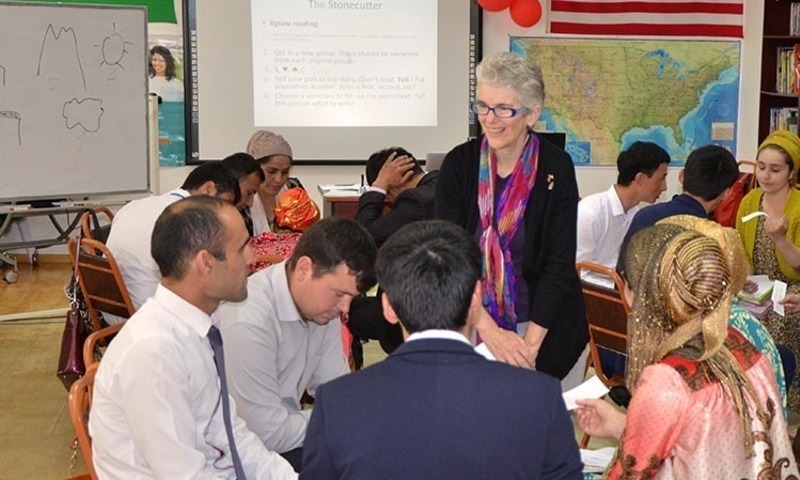 Kitty Purgason, the Chair of the Department of Applied Linguistics & TESOL in the Cook School of Intercultural Studies, has been training teachers and consulting overseas since 1982. Working abroad after completing one’s education doesn’t have to be an unrealistic dream; it can be a reality. According to the United Nations International Migration Report, there are roughly 258 million people today living in a country other than their country of birth — an increase of 49 percent since 2000. Purgason has done just that, teaching English abroad as a Fulbright scholar. In this interview, she shares her story and lessons learned through her years working abroad. How did your career journey start? I was a missionary kid growing up in India. As a result, I always knew there was more to the world than just the U.S. and I wanted to be a part of it. I was an English major in college. I soon realized that I didn’t really know what English majors do. I thought, I better be pre-med. It was a hard switch for me, and in the meantime, I looked for an opportunity to go overseas. I ended up being sent to Korea for two years to teach English through an education-exchange program from my college. I was really surprised because they didn’t send me to India. Sometimes you just have to try to find out what you love. I had never heard of TESOL, teaching English to speakers of other languages, but when I tried it I loved it. I was really grateful for that experience. Through this, I also realized that I needed more training. After getting my master’s [degree], I went to China, and when I eventually came back to the States, I began doing my Ph.D. and teacher training. I tried it out, I got some training, I tried it some more. I think that is a really good progression for any kind of career. What are the benefits of working overseas? The world is interconnected. The more we understand the rest of the world, the better we are going to navigate every part of our life, even if in the future we stay in America. It also helps us understand more about God. When we go abroad we are not only spreading the gospel or going to the unreached, we are discovering how God is a global God. When we see the way Koreans worship or the way the Chinese experience persecution, or the way these Tajiks understand who God is, it helps us more accurately know God. None of the places that I have been to have been because I heard an audible call from God to a particular place. Instead, I dipped my feet in, pursued certain things and then God confirmed it. How is English an open door to working overseas? I know there are a lot of ways to go overseas and there are a lot of wonderful opportunities in business, ecotourism, nonprofits, and so many different things, but a really big one is English. Even people who go in with a different task or agenda end up being begged to teach English. A lot of people think that because you speak English, you can teach it. That is partially true, I certainly got my start teaching English without much training at all. But, it can lead to burnout and feeling underqualified. I like people to get as much training as their next step warrants whether that’s a non-credit course or a master’s degree. I think that some people don’t want to do English language teaching because they don’t feel confident in English. I believe English language teaching is quite different. It can be reading, writing, speaking, listening or all four. Or it could be grammar, vocabulary, pronunciation or all three. Someone who doesn’t feel strong in grammar or writing might be a really great conversationalist and be really good in a speaking class. There is something for everybody. Kitty Purgason holds a Ph.D. in Applied Linguistics from the University of California, Los Angeles. She brings to her classes in TESOL methodology, curriculum, materials and intercultural communication her years of experience living, studying, serving and teaching in India, Russia, Korea, China, Turkey, Turkmenistan, Mauritania, Indonesia, Kuwait, Oman, Tajikistan, Vietnam and Spain. If you’re interested in teaching English to speakers of other languages, check out Biola’s Linguistics and TESOL department and this low-cost non-credit option. Written by Lisa Reimann, peer internship ambassador for the Cook School of Intercultural Studies. For more information, contact Lisa at csics.pia@biola.edu.